A raised bed garden kit is an essential tool when it comes to creating your own raised beds. You can construct your own raised beds using materials such as cedar or concrete blocks. On the other hand, raised bed kits can make your building tasks quick and easy. Not only can they last for years but they also give your raised bed garden a nice, attractive appearance. The good news is that there are so many raised vegetable bed kits to choose from. Connecting the corners of your raised bed can be challenging so here’s an easy way to do it…. Lumber is an excellent tool to start with. First purchase some corner brackets for raised beds. These corner brackets make it easier to join the corners of the beds. 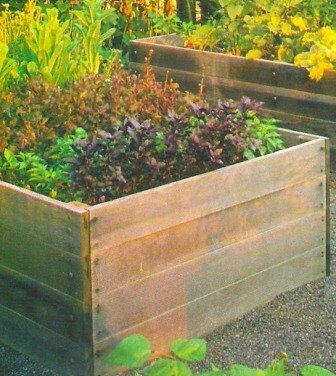 Brackets are also a good choice if you’re looking to build an unusual or unique raised bed. I must say too that they save time in the building process so you can build your beds in a relatively short space of time. Plastic and vinyl beds are great choices. They consist of many colors and are cheaper than the cedar ones. These can make your raised beds look exceptional and better yet they can last for years. Some of them are a combination of wood and plastic. There are so many raised bed kits that make building raised beds very easy. You can set up your bed in as little as 20 minutes. These kits make the building so easy that all you have to do is to level the ground, stack up the boards and insert the corner pins to create a well durable bed for your vegetables. You don’t need to use any tools as you can arrange and build your bed in a relatively short space of time. This is so convenient especially if you’re not really into building the beds all by yourself. Raised beds are available in several shapes and sizes. These beds are made from cedar which is known to be more rot-resistant than Redwood. These are excellent if you’re short of space. The two popular types are the hexagonal and octagonal which are exceptional choices by the way. The holes in these boards are 1 ½ inches that’s spaced at 4 inch intervals. This is to facilitate the extra planting surfaces within the sides of the planter. The holes are designed to keep the soil and water inside. As a result, you have additional space for growing. Hexagonal and octagonal beds come with some great features such as top rails and planter bottoms that are optional. There are so many sizes to choose from as there is a wide variety of them. These varieties even come with tall tree planters with holes for vertical growing. The design allows you to create some unusual shapes. This is possible as each individual board can pivot on its corner pins so you can be very creative when building your bed. The building steps are the same for ordinary raised beds where you just stack up the boards connect the corner pins and you’re good to go. The easier it is the better, so if you’re looking to create a raised vegetable garden with little effort a good choice is a raised bed garden kit. The design in some kits encourages the wood to decrease in size and swell in order to last for a relatively long period of time even in wet conditions. When you’re shopping for a raised bed garden kit, look for ones that use rust-free metal pins for assembly. These are some of the best kits as they’ll last long and can be dismantled easily by hand. These pins also cater for different growing options as well as providing support to climbing plants.